Tickets for home games are available on-line through the app as well as at the Box office in the ÈPP Aréna. Please, find attached the seating map above. 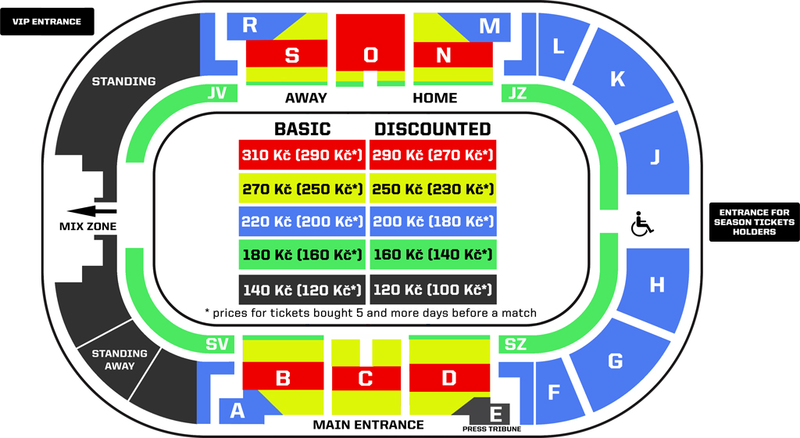 The price for standing is 140 CZK per game (approximately 5,5 Euros, payments are possible just in CZK, though). Price for children under 130 cm is 10 CZK (approximately 40 cents). You can use a credit card at the main box office. The arena hold standing space for away fans in the "dark gray" section on the map. The section is located next to home standing section behind the goal and the ice entrance. For away standing section you need tickets for standing (in Czech "Hosté").